I always want to do more than I could possible manage in a weekend. I want to spin and dye and felt and sew and and and..... well I'm sure you get the picture. I still haven't gotten a new camera but I figure thats going to be a little while coming. I did manage to find some half used mini-CD's that I can take pictures with in the meantime. 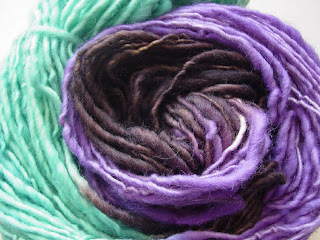 So two weekends ago (maybe three) I spun up some natural colored roving in a thick and thin single. Then... I waited. No particular reason other than I had to pull it off the spinning wheel in sets of 100. 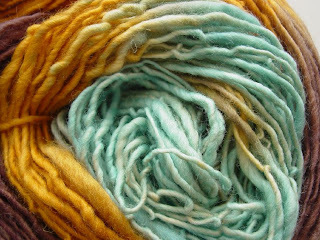 I spun 12 ounces and I got 250 yards. However, this past weekend was nice and lazy. So I took my yarns (starting on Thursday, so not quite the weekend) and began to dye them. I'm still experimenting with color combinations. I find that what I think will be a terrible combination, or what I just don't plain like, turns out really nice. 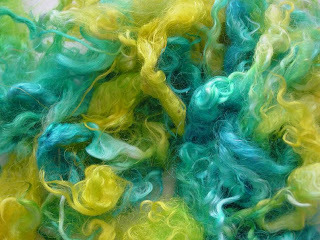 I also dyed the remaining mohair locks that I have. I chose yellow and turquoise because when they meet its a lovely shade of green. These are colors I like very much. When I get more locks, it will have to be skirted and washed. Since these weren't I have spent a lot of time and energy picking, washing and picking more little hay seeds and grass and bits from them. Much less noticeable when washed but still annoying to deal with.